I’d rather be governed by the first 2,000 names in the Boston telephone directory than by the faculty of Harvard. On July 13, Scott Walker became the 15th republican candidate to enter the 2016 race for our Whitehouse. He is somewhat of a unique candidate in that he does not have a college degree. The last president to be elected without a college degree was a Democrat, Harry S. Truman. Governor Walker left Marquette University after his junior year and went to work for the American Red Cross. Years later, he found a home in public service, leading him some 20 years later to last Monday’s announcement. Absent of this Ivy League education, Governor Walker has been elected and reelected to office in spite of the violence of the unions–led by the national disgrace and Obama advisor, Richard Trumka. The Governor has not only received death threats, but was also a political target of the Milwaukee DA, John Chisholm, a staunch Democrat. Chisolm used a “constitutionally questionable” John Doe investigation, and flagrantly employed Kafkaesque tactics to target the WI Club for Growth, supporters of Act 10, and Governor Walker—accusing them of violating campaign finance laws. These leftist, political tactics–using political agencies and clout to target conservative groups and conservative speech, are the same that caused Lois Lerner to take the 5th, the DOJ to raid Gibson guitars, and Representative Elijah Cummings (D) to target Kathryn Englebrecht, a small business owner in Texas and founder of True The Vote– an organization proved to be targeted by Rep. Cummings and Lois Lerner. Once Ms. Englebrecht founded True the Vote, her small, family business became a target of the ATF, OSHA, EPA, and the IRS. However, all of the violence, destruction and occupation of the Madison state capitol, and threats did not stop the governor from rising in popularity and winning. In the latest win for Walker, the Wisconsin supreme court threw John Chisolm’s case out of court, just in time for Walker, a veteran Harley Rider, to roll up his sleeves and begin his national campaign. In Wisconsin, we reformed our public schools and gave families as many quality choices as possible because I trust parents to make the right decision for their children. I believe that every child deserves access to a great education — be it in a traditional public, charter, choice, private, virtual or home school environment. I will push to take the power and money out of Washington and send it to our states and our schools, where it is more effective, more efficient and more accountable to the people of America. Think about it: where would you rather spend your dollar — in Washington or at your child’s school? The greatest threat to future generations is radical Islamic terrorism and we need to do something about it. On behalf of your children and mine, I’d rather take the fight to them than wait for them to bring the fight to us. Putin bases his policies on Lenin’s old principle: probe with bayonets, if you encounter mush, push; if you encounter steel, stop. So how does a company like Kohl’s make money? Scott Walker knows that the American Dream is harder to achieve without a good education from early in life and will take a person as far as they desire. 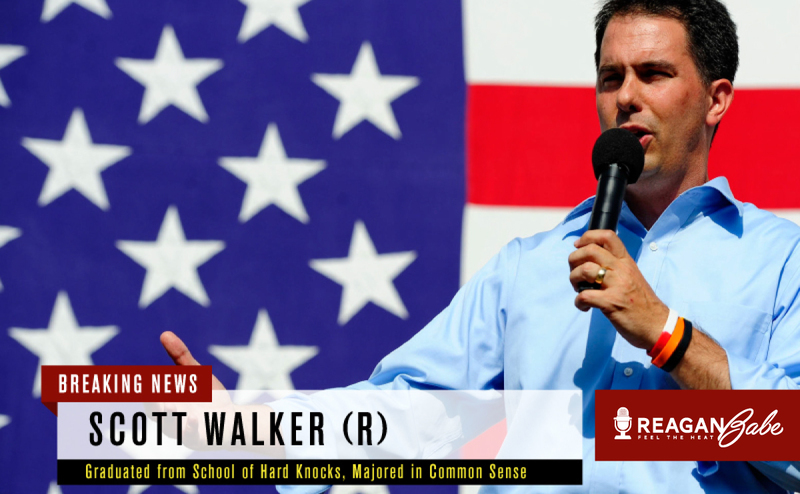 Walker, although not college degreed, is an example of leadership and achievement. President Ronald Reagan visited Providence St. Mel, twice, and inner city school in the most dangerous neighborhood in Chicago, in order to make this point. Paul Adams III, the principal of Providence St. Mel at this time, transformed a failing school into a benchmark of success. Principal Adams, from Montgomery, Alabama, understood how a good educational foundation unleashes the American Dream by breaking the cycle of poverty. Maybe Walker will also visit Providence St. Mel. Maybe not. But Governor Walker’s ideas are reminiscent of Reagan and Principal Adams, and perhaps that type of principled education is what the country will, once again, embrace. Excellent article, as always. Having lived in Wisconsin for many years, I can testify that Scott Walker is genuine–his actions as Governor have shown that he means what he says.